← Kyūyō Vol. XIX, No. 1540: In the 4th month of this year , in the Kikoe-Ōgimi Udun 聞得大君御殿, the bell tower together with the western guard house (O-Banjo 御番所) were allowed to be re-erected. Kyūyō Vol. I, No. 53: Theories about the origin of dragon boat races. It is said in the old chronicle [= Ryūkyū-koku Kyūki, 1731] that in olden times there were several dragon boats (haryūsen 爬竜舟) in Kume, Naha, Wakasa village, Kakinohana, Izumisaki, upper Tomari, and in lower Tomari. Today there are three boats, i.e. one each from Naha, Kume, and Tomari village. From the 28th day of the 4th month to the 2nd day of the 5th month they compete in the bay in front of the Chinese encampment [=Kume village]. On the 3rd day of the 5th months they row in the Western sea, and on the 4th day they compete in Naha harbor. The Chūzan Seifu  says that there were dragon boat races every year in the 5th month. It is also said that this kind of dragon boat was built and a rowing competition was carried out in the estuary for the first time after the 36 families from Fujian had arrived in Ryūkyū. In popular sayings it is said that in olden times there was a person called Nagahama Taifū 長濱大夫. His real family name has not been handed down. Once, on receiving orders, he went to Fujian province and to Nanjing. At that time he made a model of (copied) a dragon boat. After his return home, on the 1st day of the 5th month a dragon boat rowing competition was held, carried out as a prayer for peace and security. 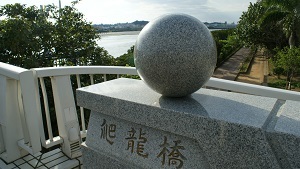 This senior official once lived in Naha Nishimura, but today this place is called Nagahama. Because of the above, every year on the 3rd day of the 5th month the persons riding the dragon boats must always wear shirokatabira 白帷子 (white linen kind of kimono) and row the Western sea. Another theory says that King Ōōso 汪応祖 (rg. ~ 1402–1413) of the Southern Realm (Nanzan) once arrived in Nanjing and learned this art. At that time he witnessed a dragon boat race held in the bay and deeply admired the contest. Returning to this country [Ryūkyū], he chose Toyomi 豊見 as the place to built a castle looking over the river. This castle served as his residence and the place was named Tomigusuku. At that time, by imitating the manufacturing method of China, said King Ōōso built a dragon boat and on the 1st day of the 5th month he disported himself rowing in the Naha estuary. The people all saw this and also built their own dragon boats. Since then, coming the 4th day of the 5th month, the dragon boats of each village always arrive below Tomigusuku castle for a rowing competition held in that estuary. Coming the current era, every year one day prior to the Dragon Boat Festival, the three dragon boats of Naha, Kume, and Tomari, always arrive at Toyomi river, and the prayer woman of Tomigusuku prepares offerings to pray for good fortune. The dragon boat persons also go up to the harbor house in order to perform worship towards Toyomi river. 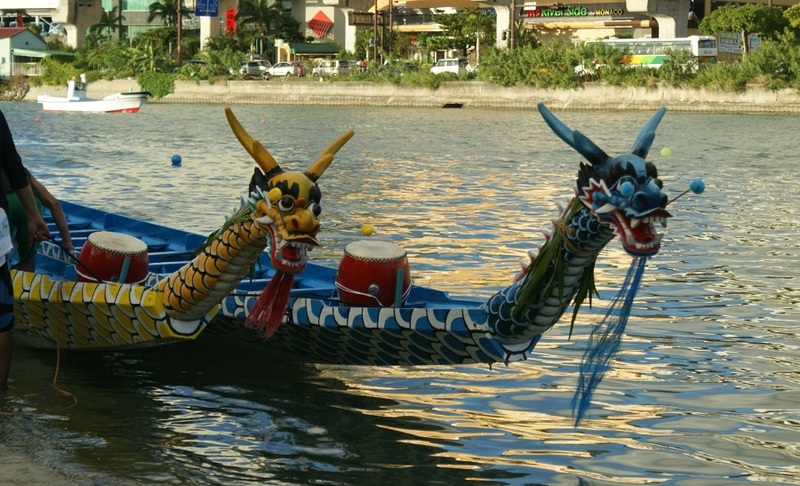 This is how dragon boat races are said to have originated. However, for a long time of successive generations no detailed accounts are known. Haryū-bashi 爬龍橋 or “Dragon Boat Bridge.” Original photo by the author. Notes: The Ryūkyū-word Hārī ハーリー literally means “to mount the dragon.” It derived from the Sino-Japanese reading of the characters Haryū 爬龍. In Tomigusuku there is also the Haryū-bashi 爬龍橋 or “Dragon Boat Bridge.” It branches off at the beginning of Toyomi Ōhashi bridge over to Naha Kobagura. The “Tomigusuku Haarii Song”. Original photo by the author. 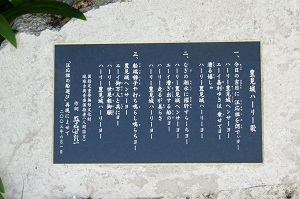 On the other side of the road is a stone monument, displaying the “Tomigusuku Hārī Song.” This song tells about the above mentioned King Ōōso 汪応祖 (rg. 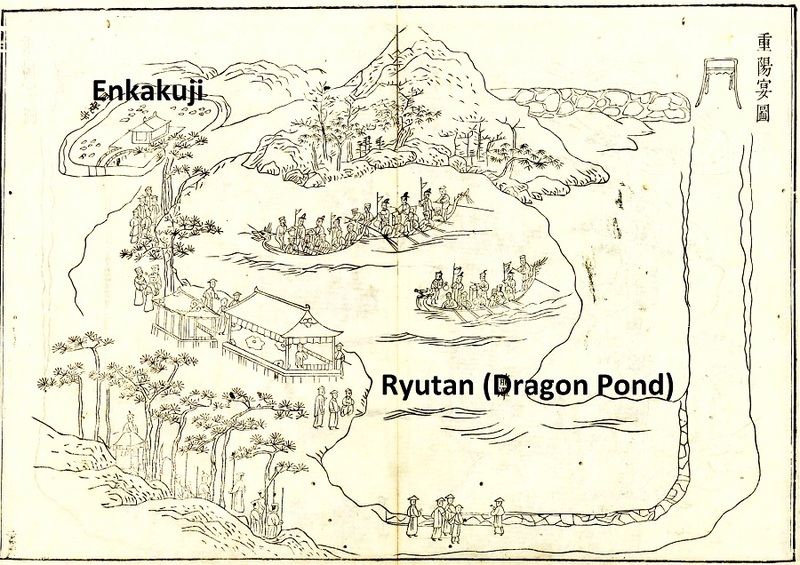 ~ 1402–1413) of the Southern Realm (Nanzan) and how dragon boat racing was introduced by him. Tomigusuku also has a dragon boat club. Naturally it is their believe that dragon boat races actually originated in Tomigusuku. 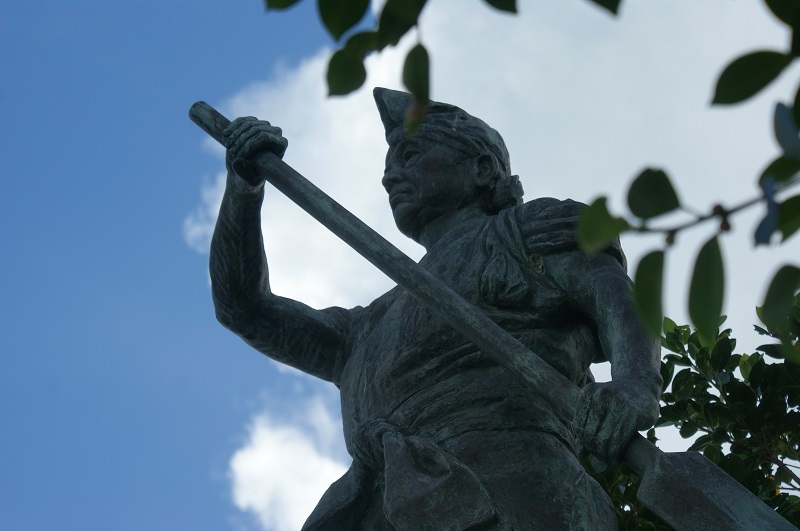 Statue of dragon boat rower. Original photo by the author. 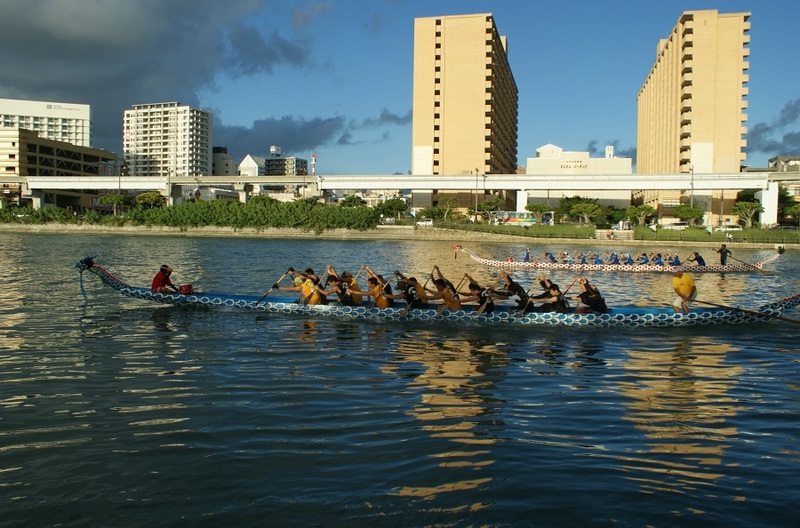 Hārī boat race on Tsubogawa, between Tomigusuku and Naha estuary. Original photo by the author. Hārī boats of the Tomigusuku Hārī Boat Race Association. Original photo by the author. Depiction of the dragon boat race on Ryūtan Pond below Shuri Castle on occasion of the Chrysanthemum Festival (the 9th day of the 9th lunar month) held for the Chinese investiture envoys. From: “Zhongshan Chuanxin-lu” by Xu Baoguang, 1719. © 2016, Andreas Quast. All rights reserved. This entry was posted in Kyūyō and tagged dragon boat, Tomigusuku, ハーリー, 爬竜舟, 爬龍. Bookmark the permalink.